The final day began with American Brandt Snedeker tied with Argentine Angel Cabrera atop the leader board at seven under par, with Australians Adam Scott (-6), Marc Leishman (-5) and Jason Day (-5) all hot on their tails. Day took control early, going -3 through the first two holes to move to eight under and an outright lead. Day fell behind Cabrera again, up until the 14th hole, where the incredible luck needed to win the Masters came into play. Day’s drive hit the base of a tree and deflected into the middle of the fairway. Day made the most of his good fortune and birdied the 14th, while a water-hazard saw Cabrera bogey the 13th hole, gifting Day the lead. It looked as though Day, ranked 36 in the world, would become the first Aussie to don the famous green jacket as he two-putted a birdie on the 15th, giving him a two stroke lead. Meanwhile, 32 year-old Adam Scott struggled on the greens – despite great stroke play – and Marc Leishman began to lag behind. There was still plenty of drama to come. Day put his ball left of the green on the par three 16th hole, while Marc Leishman’s brave effort was all but over as he found water on the 15th hole. Scott was dangerously close to joining his compatriot in the drink, as his approach shot just held in the second-cut. A few inches shorter and it would have rolled back into the water. Scott was able to salvage a birdie on the 15th to bring him within a stroke of outright leader Day. Just moments later, Day bogeyed the 16th hole. Momentarily, two Australians were tied atop the Masters leaderboard. Nightmares of Greg Norman in 1996 resurfaced in the minds of Australian golf fans everywhere, as Jason Day bogeyed the 17th hole. This took him to seven under for the tournament, one behind Scott and Cabrera, who had just made a six-metre birdie putt on the 16th. Scott was given another opportunity to heap the pressure on Cabrera but could not make it count, leaving his birdie putt on 17 short. With Day and Leishman out of contention, Adam Scott carried the hopes of a nation, tied with Cabrera on eight under par heading into the 18th hole. After salvaging a tee-shot into the second-cut, Scott was left with a similar putt to the one Day had missed moments before. Under immense pressure, Scott knocked the putt in, after what had been an ordinary day with the flat stick. This meant Cabrera needed a birdie on 18 to force a playoff. What came next was something special. Cabrera smashed his tee-shot into the middle of the fairway, then, with pressure building, made the best approach shot of the tournament. Cabrera sunk a simple two-foot putt, forcing Scott into a playoff. With the rain coming down, Scott – who had celebrated like he’d won the Masters after his putt on 18 –teed-off first in the playoff. Both Scott and Cabrera left their approaches short after matching each other’s tee-shots. Cabrera’s chip was millimetres away – as was his second green jacket – but the ball went past the hole, and Australia breathed a sigh of relief. Scott put his chip within 2 feet of the hole. Both men tapped in, and the pair headed to the second playoff hole. Cabrera’s incredible strength was on show on the tee-off of the 10th, where he hit an iron as far as Scott hit his 3-wood. Both mens’ second shots got them on the green but Scott was left with an easier, downhill putt, compared to Angel’s right-to-left break. Australia cheered as Cabrera’s putt went past the hole by a few inches, leaving Scott with a makeable downhill putt to win the 2013 Masters. Complete silence ensued as Scott struck his putt, broken only by the sound of a golf ball falling into the bottom of the cup. Scott celebrated joyously before high-fiving caddy Steve Williams – who had previously caddied in three Masters wins with Tiger Woods – and being congratulated by a gracious Cabrera. By knocking in that last downhill putt, Scott ended Australia’s 77-year Masters hoodoo, which had got the better of many great Australian golfers. Scott was quick to thank one of them – his hero, Greg Norman. 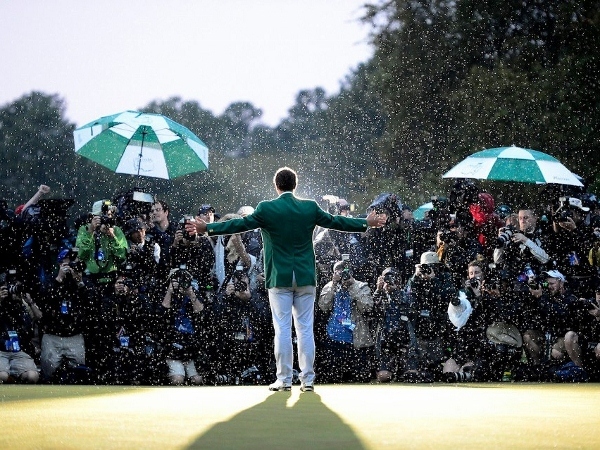 Yesterday Scott became more than just the first Australian to win a green jacket. He also established himself as the Shark’s replacement – an inspiration for a new generation of golfers.